"Hey Alex, those are concrete pier repairs. There is an expansion joint above that pier and at some point years ago it was leaking onto the concrete below. Allot of times leaking water will weather the concrete. 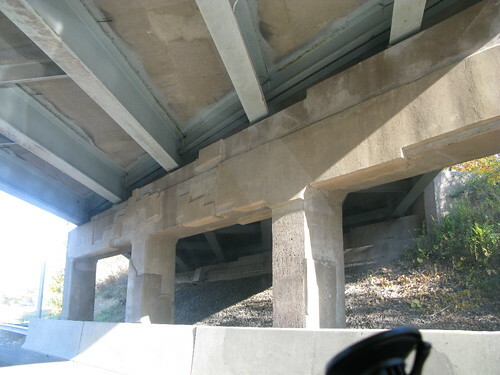 Water will infiltrate the concrete and cause rust to form on the reinforcing steel 2-3 inches inside. The concrete will then become hollow and delaminated. Repair crews will go in and jack hammer this hollow concrete, nail plywood forms in place and pour in grout forming these patchwork patters. The surface concrete has no structural properties; it simply protects the reinforcing steel and structural concrete behind the steel." Awesome. Much respect to Bridge Expert Josh!